"That's not very green" she said, pointing at the 2-4 of water bottles that I had just heaved into the grocery cart. I could hardly argue the point, and looking at her pink, Swiss-made and distinctively refillable aluminium bottle didn't help. But I still went ahead with the purchase. Even after five years in Canada, I have a hard time drinking unfiltered tap water. Not because I don't consider it safe. On the contrary: Because there is no doubt it is safe - given how much of chlorine it tastes. It's bad enough that I get the odd mouthful when I am in the pool. I certainly don't enjoy drinking it intentionally. "You've been spoiled", she would then say. And it is on days like today that I come to realize how true it is. Since Saturday, I've been taking advantage of the warm and sunny summer weather to hike across the Swiss countryside. As I'd always taken it for granted, I carried but a small bottle of water in my backpack, filling it up again at every village's communal fountain. When North Americans talk of a water fountain, they think of a small steel bowl with an upward-pointing faucet, used by cheapskates in shopping malls and airports to quench their thirst instead of buying a pop. Building codes require a few of these in public places, and they are frequently hidden in obscure corners, where they dispense the above mentioned chlorinated concoction. 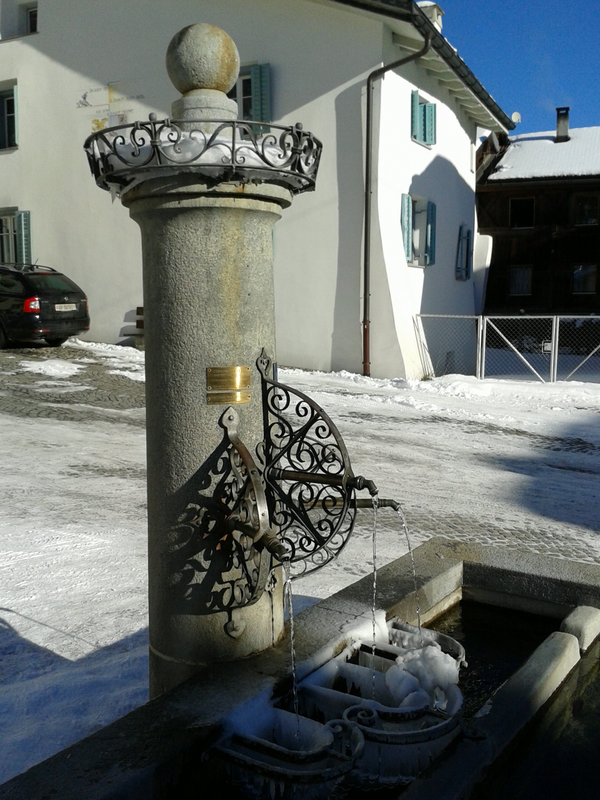 Most importantly, though, the fountains offer perfectly fresh, clean, and utterly drinkable water to everyone (the town of Scuol in the picture has even got a fountain with three faucets spouting three different mineral waters). And while villagers no longer wash their dirty laundry in public (well, at least not in the literal sense), they certainly still appreciate the fountains to quench their thirst on school trips, boyscout camps, bike rides, hikes, or simply during a quick roadside stop. In Montréal, I had to buy a water belt to keep me properly hydrated during the training for last year's 21km run, with only one functioning water fountain along the Lachine Canal. I would not have had this problem in Zurich. But there is hope yet, for at least our new office building has invested into a water filtering system that comes with taps in each kitchenette which finally offer a filtered, odor- and taste-free version of the local eau du robinet, and therefore something I'm perfectly willing to drink. It seems appropriate, then, that I will return to Canada with my own Swiss-made, refillable aluminium bottle. It may be red and white. But it is also very green.